Folks will say this blueberry-topped sour cream coffee cake is too pretty to dig into. But dig into it they will—and they'll be happy they did! Combine flour, lemon zest, baking powder, baking soda and salt. Reserve 1 Tbsp. sugar. Beat butter and remaining sugar in large bowl with mixer until light and fluffy. Blend in sour cream and eggs. Gradually add flour mixture, mixing well after each addition. 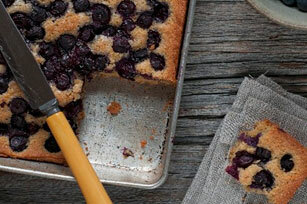 Pour into 9-inch square pan sprayed with cooking spray; top with blueberries and reserved sugar. Bake 55 min. or until toothpick inserted in centre comes out clean. Cool cake in pan 10 min. Remove from pan to wire rack; cool completely. Top each serving with 1 Tbsp. thawed Cool Whip Whipped Topping.